Golf tees are surprisingly useful for more than just its primary purpose of teeing up a golf ball. For example, I store a couple hats in our garage to keep my bald head warm during chillier runs or protect it from the sun when I'm out awhile. 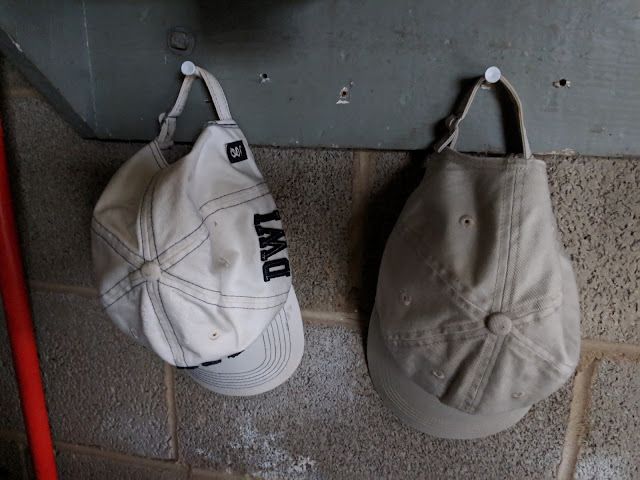 For years those hats hung on rusty nails, but recently I pulled them out and tapped in a couple white tees, as shown below. Nice little upgrade. The link from This Old House has ten more golf tee ideas that you might find useful. Shout out to my friend Keith F, who introduced me to the incredibly flexible golf tee!